To sweep an eye over a stunning new kitchen decor with sophisticated and state-of-the-art faucets and fixtures can provide an immense sense of joy. But to have that feeling murdered when the view stops at a dirty and outdated kitchen-sink? The pain of having to express this feeling in words could be well avoided if one could have just the thing they’ve been looking for. And the good news is that, if it’s about the perfect kitchen sink for your perfect kitchen, then we’ve got you covered! One of the most brilliant kitchen basins that we’re reviewing for you is the Houzer Premier Gourmet Series Topmount Single Bowl that will be just the showstopper for your kitchen. How? Simply read the space below to know more! What did we like about this model? Houzer, for three decades, has been one of the names that has carved a niche for itself among the top-notch ones in the league. Providing over 100 beautiful models for its stainless steel range alone, it is gradually leaving an indelible mark over revolutionary kitchen decor. It also presents a range of “traditional to contemporary” designs reflected in models such as quartz, granite, fireclay, porcelain enamel steel, and copper. When It comes to features we certainly cannot put a finger anywhere on this Houzer beauty that we don’t admire. With clean lines, polished curves and an outstanding finish, the product is definitely going to win every heart with its design and functionality. Comes with one basket strainer, cut out templates, fasteners and installation manuals. Although we didn’t have very high expectation of the product, we must say we were pleasantly surprised with its overall delivery after we installed it in our kitchen space. Apart from its admirable design and finish, the sink features a rear-set 3-½” drain opening and offers a large workspace that measures 15-¾” from front to back. The sink is 9 inches deep, measuring 29-¼” across and can hold around 2 cubic feet of liquid. This helps immensely when you have to soak larger pans and prevents water from splashing around. The sink also gives you the advantage of 4 mounting holes, which you can use with a variety of other fixtures and it fits any 36” sink base providing ease of use and space efficiency. This is something that we really admired about this kitchen sink. It comes with the brand’s own StoneGuard undercoating feature and a Super Silencer pad that prevents the annoying clatter of dishes and utensils. It also keeps the water warm for efficient cleaning and comfort, all at the same time. Then it helps prevent under-sink condensation and maintain the overall finish of design from collecting sediments and scales over time. 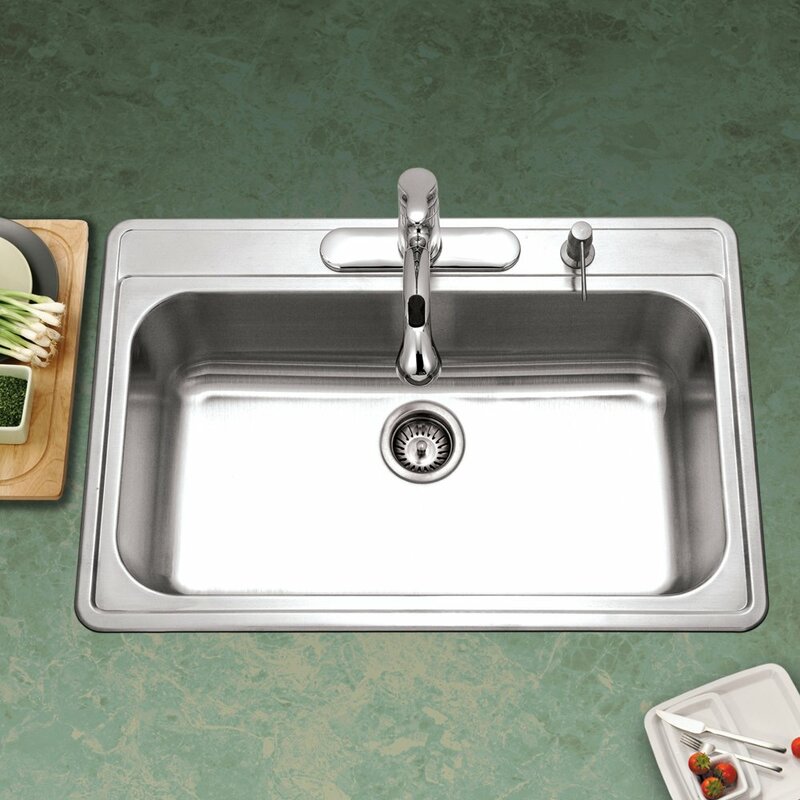 The sink is manufactured using highly durable 18-gauge, type-304 stainless steel that comes with a combination of nickel and chrome. This presents a corrosion-proof finish and deflects the onslaught of stains and dents. It presents a hygienic surface that is easy to maintain and blends seamlessly with any form of kitchen decor, making an elegant statement. 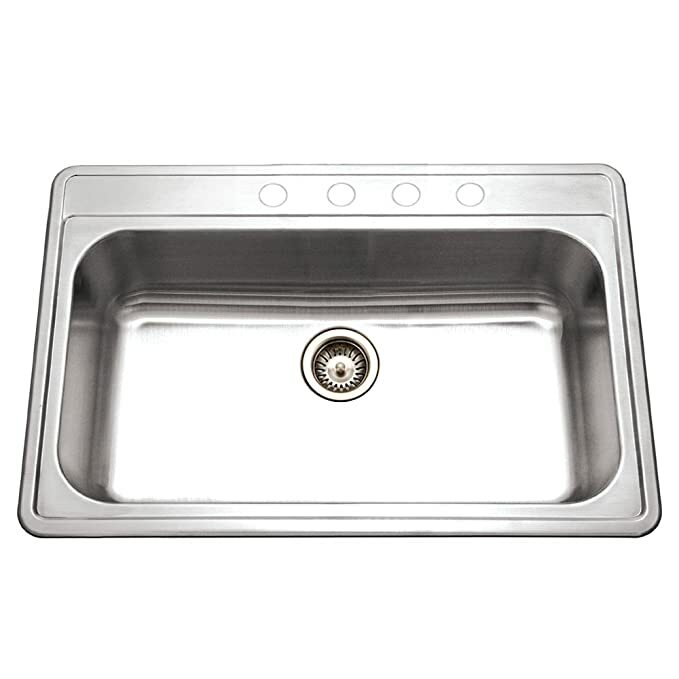 The Houzer Premier Gourmet kitchen sink adheres to the ASME A112.19.3-2000 and meets the UPC/IAPMO (International Association of Plumbing and Mechanical Officials) and CSA (Canadian Standard Association) certification standards. It is also backed by a limited lifetime warranty. This means that you do not need to break a sweat worrying about the safety of the product. The warranty also makes the product worth the kind of investment that you make for it (can be a tad bit expensive for some). The only thing that we wish could have been better about the product is its installation procedures. Although it is designed to be space efficient and fit right in, we noticed that setting it in the counter might take a bit of an effort due to its outer lip or rim design which can be a bit tricky to work with. The bottom of the sink may collect a bit of water and we think it’s a design flaw. Also, sadly, it is not as scratch-resistant as you would expect it to be. It does scratch easily which can cause stains to set in if the finish gets scraped off. Apart from these, it can be the ideal accompaniment for a nice and clean kitchen decor. We hope you found our review of Houzer Premier Series to be useful and informational. We believe in giving you a review that is based on a first-hand experience using the product so that you can find the perfect product at the best price. And we’ll be back with more!